-	Treatments include at least a check (non-fertilized) and a fertilized treatment. -	A minimum of 2 replicates per treatment. -	A soil-test value (STV) of Bray-1 P.
-	Additional (non-exclusive) data included: soil characteristics (soil type, soil carbon, pH, soil texture), rainfall (quantity and distribution), crop management (genotype, crop density, planting date) and details of statistical design. -	Internal reports of INTA (National Institute of Agriculture Technology), CREA (Regional Consortium of Agriculture Experiments), and FERTILIZAR Civil Association. -	Proceedings of Congresses and/or Symposia. -	Relevant non-published experiments from public and private sector. Database were built-up and managed with Microsoft® Excel due to its flexibility to import and export data. Data was analyzed by using descriptive statistics and regression analysis. Critical soil test values (CSTV) were estimated by a modification (Correndo et al., 2016) of the Arcsine Logarithm Calibration Curve approach (Dyson & Conyers, 2013). Figure 1. Geographic distribution of P trials in soybean in Argentina performed between 1971 and 2014 cropping seasons. Relative yield (% of maximum yield in each experiment) was associated with Bray-1 P level. Estimated CSTVs did not show consistent differences between soil types for soybean (Fig. 2). The global CSTV was 9.9 mg kg-1, with a confidence interval between 9.2 and 10.7 mg kg-1. Soybean yield response to P ranged from -1636 to +3233 kg ha-1, with agronomic efficiencies (PAE) ranging from -182 to +234 kg soybean kg P-1. Soil test value of P explained most of variation of yield response and PAE also showed different distributions for the different P rate groups (Fig. 3). Considering three different classes of Bray-1 P level (low, medium and high), STV lower than 10 mg kg-1 and higher than 15 mg kg-1, respectively, showed the highest and the lowest probability to obtain a PAE superior than historical prices ratios (Fig. 4). Figure 2. Relationship between relative yield (RY, %) and soil Bray-1 P level in the top-soil (0-20 cm) for soybean. A single function was fit for all soil types in soybean (r = 0.36). Data from 436 experiments of P fertilization in soybean in Argentina. Adapted from Correndo et al. (2015). Figure 3. 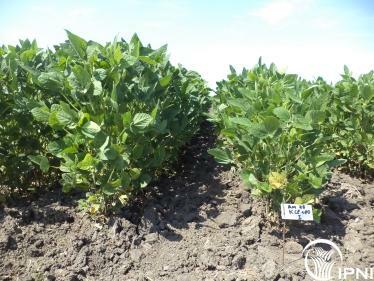 Relationship between P agronomic efficiency (PAE, kg grain kg applied P-1) in soybean and soil Bray-1 P level in the top-soil (0-20 cm) for 3 different levels of P rate. Grey strips represent percentiles 25% and 75% of historical prices ratio (kg grain kg P-1) in Argentina. Data from 436 experiments of P fertilization in soybean in Argentina. Figure 4. Cumulative relative frequency of PAE (%) in soybean for different levels of Bray-1 P in the top-soil (0-20 cm) for three ranges of P rate. Grey strips represent the range between percentiles 25% and 75% of historical prices ratio (kg grain kg P-1) in Argentina. Data from 436 experiments of P fertilization in soybean in Argentina. Yield response to P and PAE showed relationships with Bray-1 P level and P rate. The analysis of differences in CSTV, yield response and PAE between different soil types require further steps to make solid conclusions. The analysis of within and between experiments variability (meta-analysis) is the next phase of this project. The authors are thankful to many researchers from public and private institutions that have shared their data and greatly helped in the development of this project. Correndo, A.A., F.H. Gutiérrez Boem, F. Salvagiotti, & F.O. García. 2016. Método alternativo para estimar niveles críticos de nutrientes. XXV Congreso Argentino de la Ciencia del Suelo. Ordenamiento territorial: un desafío para la ciencia del suelo. 27 de Junio al 1ro. de Julio de 2016. Río Cuarto, Córdoba, Argentina. AACS. Dyson, C.B., & M.K. Conyers. 2013. Methodology for online biometric analysis of soil test-crop response datasets. Crop & Pasture Science 64, 435-441.